Irish pubs, Irish history and a parade that's been a tradition for more than a century: Boston is America's best destination if you want to celebrate St.Patrick's Day with gusto in 2019. Many events are scheduled in the city during the weeks surrounding St. Patrick's Day on March 17. None is more mandatory for revelers than Boston's annual St. Patrick's Day Parade. The parade is a South Boston tradition that dates back 118 years as of 2019. Here are the details you'll need if you plan to be among this year's parade spectators. When is Boston's St. Patrick's Day Parade? For 2019, the St. Patrick's Day Parade is scheduled for Sunday, March 17: right on St. Patrick's Day. It's still winter in Boston (spring officially arrives on Wednesday, March 20), and chances are good you'll need to bundle up if you're going. The parade is the largest of the many St. Patrick's Day events held in and around Boston each year. 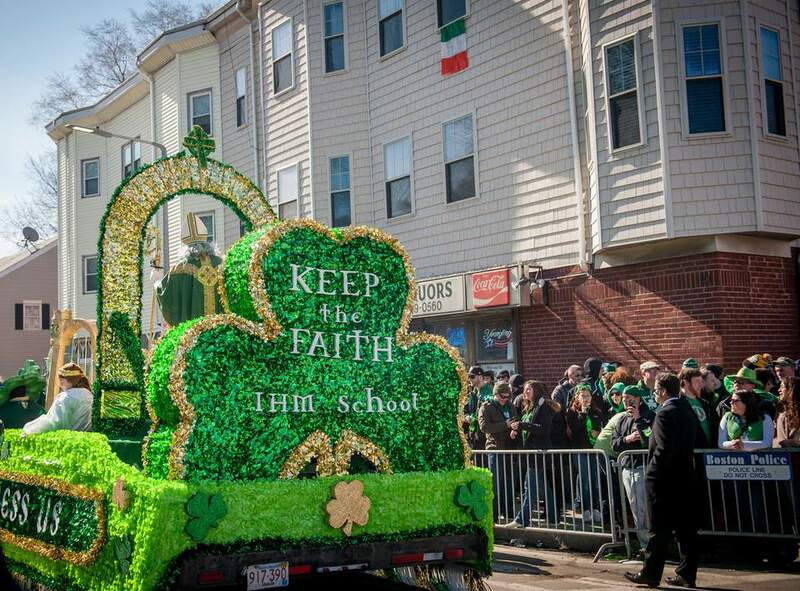 The St. Patrick's Day Parade is held in South Boston (a.k.a. "Southie"), the city's most Irish neighborhood. What Time Does the 2019 Parade Begin? The St. Patrick's Day Parade in South Boston begins at 1 p.m.; it typically runs for about two and a half hours. How Many People Attend Boston's St. Patrick's Day Parade? An estimated 600,000 to 1 million people attend the St. Patrick's Day Parade in Boston each year. You'll need to arrive early to stake out a viewing spot along the parade route. Wear green if you want to fit in! The parade begins at the Broadway MBTA station and ends at Andrew Square. Your best bet for viewing the parade is to stake out a spot anywhere along Broadway. This map shows the Boston St. Patrick's Day Parade route. Boston's St. Patrick's Day Parade features dozens of bagpipe and marching bands from Ireland, Boston and across the United States, plus colorful floats and more. Can I Get to the Parade Without Having to Drive and Park? Yes—Take "The T," Boston's subway. You'll want to take the Red Line to either the Broadway "T" station or the Andrew "T" station. Driving in from west of the city? Here's how to Park on the Mass Pike and Take the T Into Boston. Can I See Photos of Past St. Patrick's Day Parades in Boston? Of course. From boston.com, here is a look at past parades from the 1990s, the 1980s, the 1970s and even the 1960s. The official St. Patrick Day Parade Web site also shares a gallery of images of Southie's biggest day of the year. Call the Greater Boston Convention and Visitors Bureau toll-free at 888-SEE-BOSTON. Boston Discovery Guide offers this helpful roundup of hotels that are convenient for parade-goers.